Although considered the most masterful Flemish painter of the late 15th Century, his only work confirmed with attribution is his Portinari Triptych, now in the Uffizi Gallery. 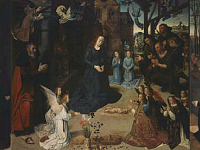 His work is distinct from contemporaries such as Hans Memling (1430 – 1494), capturing a psychological depth and quality of religious representation that could be both eccentric and profound at once. 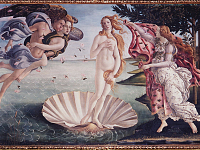 His early life is lost to history and he is first documented in 1467 as a member of the Artists Guild of Ghent, Belgium, where he might have been born. His Portinari Triptych is a depiction of the nativity, commissioned by Tommaso Portinari, who worked for the Medici family in Bruges. Portinari had also commissioned a piece from Han Memling, called the Portinari Triptych, and both works were executed for the church in the Hospital of Santa Maria Nuova in Florence. Portinari and his family are also depicted in one of the panels of the work. Van der Goes skilful handling of Oil painting went on to influence the Italian painters who saw his work in Florence, additional to his Flemish contemporaries. There are a number of other religious paintings, as well as portraits thought to be van der Goes. Of these works is the Calvary Triptych, The Death of the Virgin, and The Monforte Altarpiece.